If you travel you probably visit Starbucks. I know I personally visit Starbucks more than I probably should. So when they are basically just giving away free drinks, I pay attention. And I like earning Chase Ultimate Rewards as well. This offer will be in the Inbox in your Starbucks app. I’m not sure if this is targeted or not but everyone seems to have the offer. If you don’t you may need to log out and back in to the app. All that is required to earn these points are three (separate!) 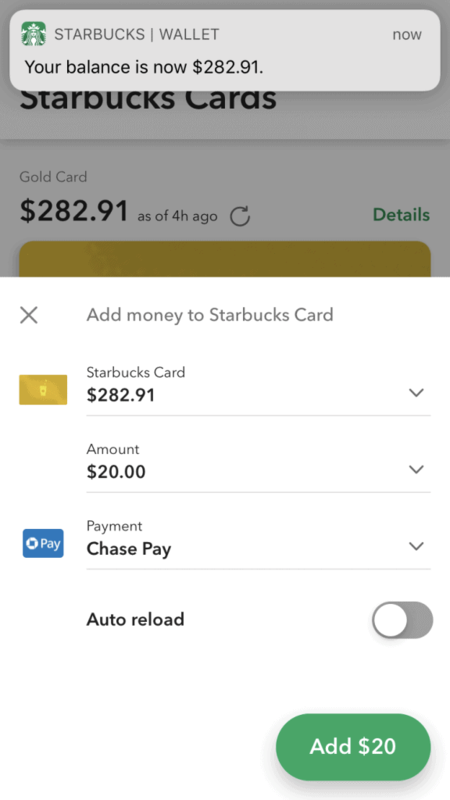 reloads of $20 or more into your Starbucks balance using ChasePay. 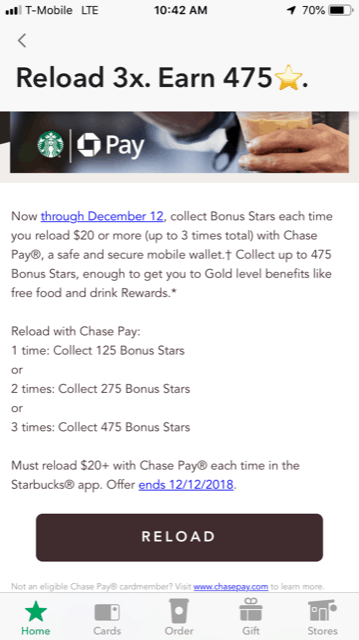 And if you charge the reload to your Chase Freedom card, which earns 5x Ultimate Rewards points this quarter (worth a minimum of 7.5 cents a piece if you also have the Chase Sapphire Reserve card) as part of its rotating 5x categories that include ChasePay, warehouse clubs and department stores Oct-Dec 2018, you are essentially earning a minimum 7.5% cashback on your spend PLUS earning almost four free drinks. You just have to do 3 separate reloads of $20. NOTE: Some people are reporting receiving a separate offer from Chase that is offering 1,500 Ultimate Rewards points when they make any 5 ChasePay purchases totaling $25 or more. In that case, make sure to do these for $25 instead of $20 so you accomplish both tasks at once! The other thing to watch out for is that you need to set your Primary Card inside of your ChasePay app (it kind of appears that you could select ChasePay here and then maybe be asked which card you want to use but I learned the hard way that isn’t the case). So be sure to set that to your Freedom in the ChasePay app and *then* make the purchase. Share your thoughts… here, on Twitter, or in the private MilesTalk Facebook group.